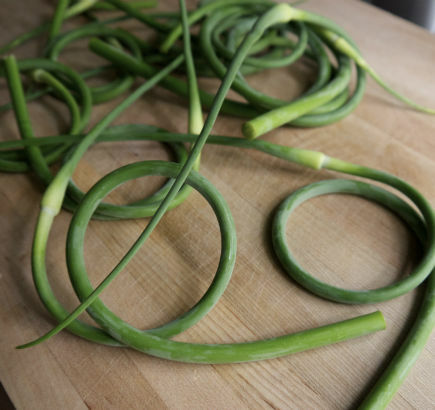 Garlic scapes are curly flower stalks that emerge from the hard-necked variety of garlic in June and early July. As the stalks grow they form pretty curlicues. Farmers snip off the scapes, or stalks, before the flower heads mature, allowing the plant to direct more energy into the developing garlic bulb underground. When the garlic scapes are still in full curl, they are tender and succulent. They have a sharp garlicky taste that is a bit milder than a raw garlic cloves, but still have a nice bite. Look for smooth silky feeling stems that are bright green and firm. Garlic scapes can be used in a variety of ways; used raw in salads, eggs and potatoes; blended into hummus; grilled, sautéed or stir fried. 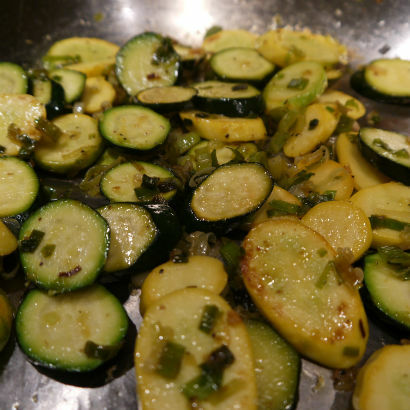 Sautéing will take the edge off slightly and make them a little more palatable for everyone. My favorite way to enjoy them is in pesto. Making pestos are a lot of fun, and the sky is the limit with flavor combinations. It does take a little trial and error to get just the right texture, but once you do you can use them on bread, vegetables, pasta and proteins. It’s a great way to add a burst of flavor to any dish. This week in my CSA I found garlic scapes, summer squash and young leeks. I was in the mood for a nice pasta salad and got to working on a dish using those ingredients. After a chop and saute of the scapes, I added the sliced leeks and squash to the same pan, allowing them to soak up some of the flavor left behind. 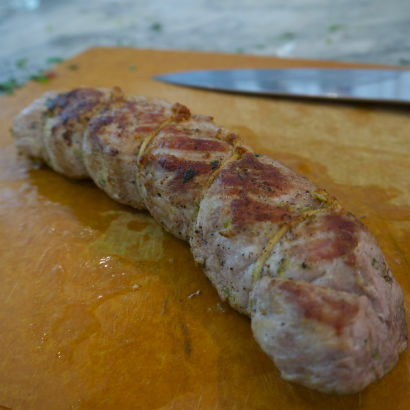 This is one of those dishes that you can do in around 30 minutes, with a little timing. While the water is coming up to a boil you are sauting the scapes. Then while the pasta cooks so do the vegetables, and you make the pesto. Multi-tasking is always the name of the game when crunched for time, or at the end of a long day. Keep a little of the pasta water to thin out your pesto and help distribute it around the noodles. A great chef tip used by many! 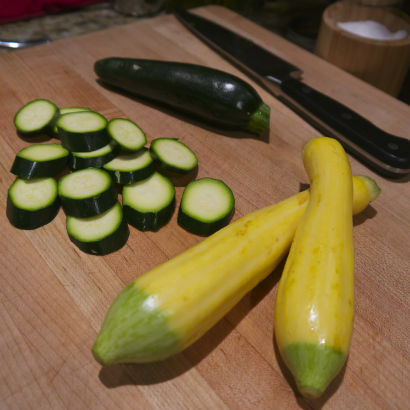 Once you get your Garlic Scape Pesto Pasta with Sautéed Summer Squash plated, garnish with a little reserved almond and pecorino. 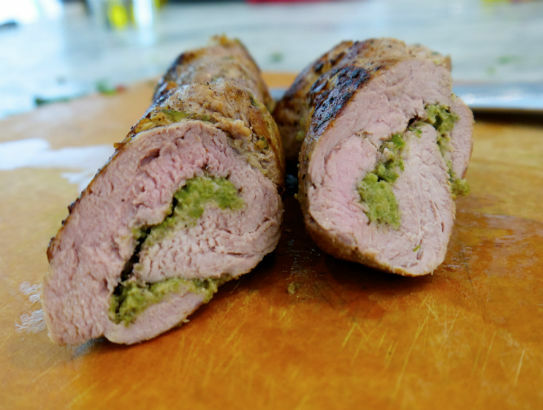 Another great way to use your pesto is in a roulade. 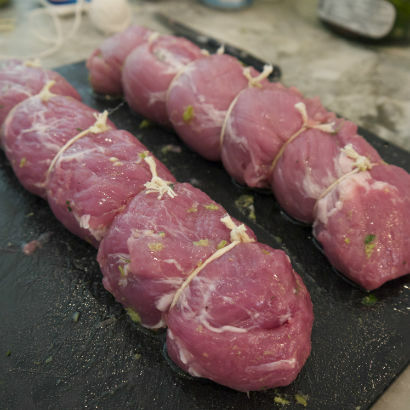 Simply butterfly your pork tenderloin or chicken, season with olive oil, salt and pepper. 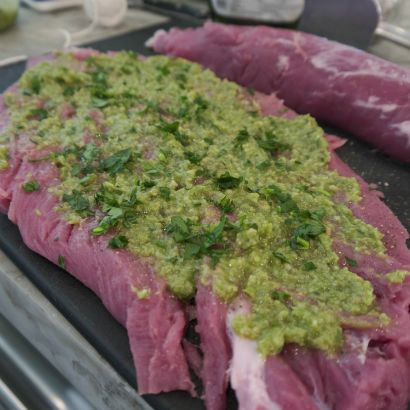 Spread the pesto over it and top with some fresh breadcrumbs and parsley. A stunning and delicious dish that is easy to put together. My last idea using garlic scapes is a recipe I had posted previously. Using edamame beans, found pretty easily in the freezer section of the grocery store, combined with raw scapes. 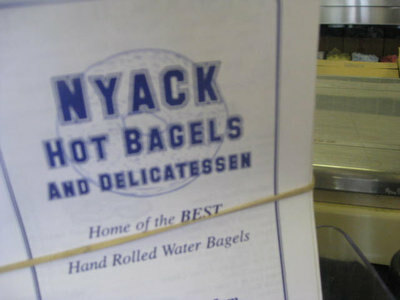 The combination is fresh tangy and very addictive. I like scooping it with a chunk of a good crunchy crusty bread. 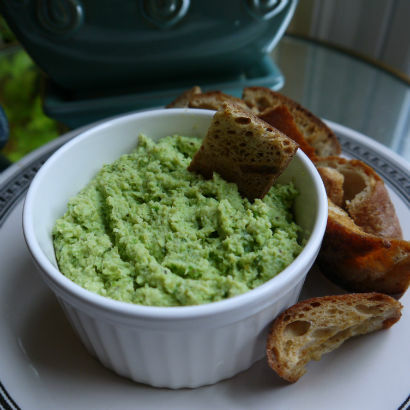 Click this recipe link for: Garlic Scape Hummus. 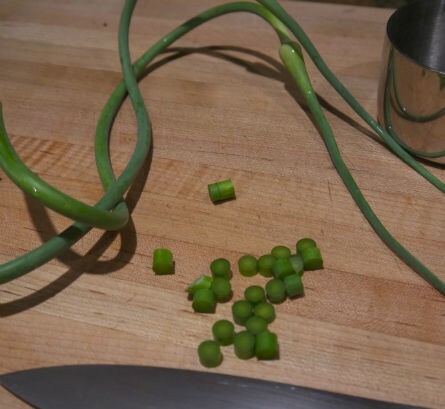 Garlic scapes will be around for a few weeks, so pick up a bunch and give them a try. Coming up next week we will explore a beautiful green called mizuna. 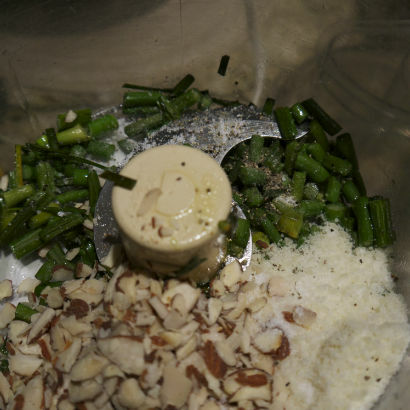 Until then ..
Add the almonds and pecorino to the food processor along with a ½ teaspoon of salt and ¼ teaspoon of pepper. Process until finely ground. 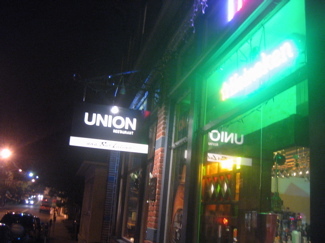 With the machine running add ½ cup of olive oil and about ¼ – ½ cup of pasta water. The water will help thin it out a little, just don’t let it get too watery. Add the remaining zest of the other half of the lemon and juice. Process to combine and taste for seasoning. Drain the pasta, reserving a little of the pasta water and place in a large serving bowl. Add enough pesto to coat the noodles and use the hot water the help distribute it well. 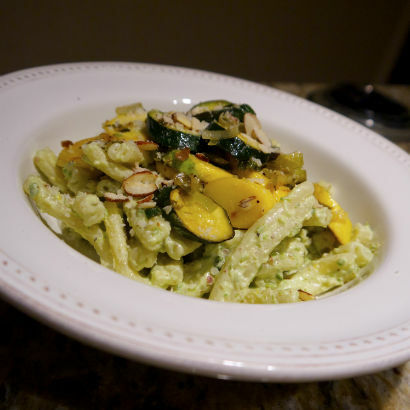 Top with the sautéed squash and garnish with the reserved almonds and pecorino. Cooks note: The pesto recipe will make about 1¾ cups of pesto. 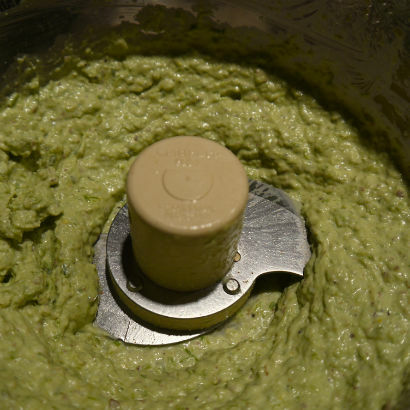 Take the leftover pesto and place in an ice cube tray and freeze for later.